Dunstan had his abscess drained on Monday and has been back home recovering. 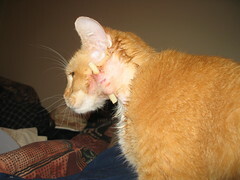 Tomorrow (Thursday), he gets his drain removed from his cheek. In the meantime, I’ve been giving him hot compresses two to three times a day and amoxicillin twice a day, per doctors orders. Dunstan has also been relegated to wearing The Cone™ so he doesn’t try and remove the drain himself. This causes a very interesting slinking effect when he walks. Pingback: IMG_0137 on Flickr - Photo Sharing! poor kitty. hope he’s feeling better soon!